As many as 145 representatives from 70 villages, which face the danger of losing their land for the tourism project around Kevadia, met Cabinet ministers of the Modi government, including finance minister Nitin Patel, revenue minister Anandiben Patel and tribal and forest minister Ganpat Vasava. The talks, which took place in the presence of Narmada district collector Rakesh Shankar, ended after the ministers succeeded in getting a promise from the representatives that they would not disturb Gujarat chief minister Narendra Modi’s proposed rally off Narmada dam, which is to take place on October 31, the birth anniversary of Sardar Patel. Modi’s rally is being organised with the declared intention to “collect” iron from farmers around the country to “build” the highest 182-metre statue of the world – Statue of Unity – in the memory of Sardar Patel. Senior IAS bureaucrats have been dispatched to different parts of the country to “convince” farmers to come with iron for the statue. Insiders, however, say that the state government will not be using the iron for the statue as it is “technically not feasible. The iron will be mostly used for decorations, including railings, around the Statue of Unity, which is proposed to be the central attraction while converting the whole area into a tourist spot. The meeting took place following a veiled threat by the Kevadia Area Development Authority (KADA) to several of the village panchayats around Kevadia that they should “allow their lands to be used for tourism purpose or face consequences.” A KADA chief executive officer letter to as many as 52 village sarpanches threatened the villagers in these words in March, but later retracted saying his letter was “misunderstood”, calling the sarpanches for a compromise. 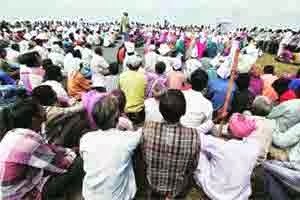 As the compromise failed, the projected affected villagers held a well-attended meeting off Kevadia on October 2, where it was decided to intensify the stir. This woke up Gandhinagar, which called the villagers for negotiations. · The six villages (Kevadia, Vagadia, Kothi, Limbdi, Navagam and Gora), whose land was taken away to build the Narmada dam without any compensation in line with other project affected persons of the Narmada project, should either get back their land or they should be paid compensation according to the Narmada tribunal award. · Decades ago, the villagers, whose lands were taken away, were told that the acquisition was being done only for the dam, and no other purpose. Since the purpose has been solved and the colony is not needed any more to house officials to implement the project, there is little reason to come up with any other activity like tourism in the region, which is proposed through KADA. In fact, the tourism project should be abandoned. · Work for the proposed Garudeshwar weir, to be built 12 kilometres downstream of the dam in order to convert the whole area into a huge lake to encourage tourism, should be stopped immediately. The weir, it was pointed out, would affected fishery activities, and no environmental clearance has yet been taken for it, though it is part of the Narmada project. · There should be an urgent decision to work for giving irrigation water from Narmada and Karjan dams to the villagers surrounding the Kevadia, even if it may mean lifting of the water from Narmada river. Currently, the villagers of the region, which gave away their lands for Narmada and Karjan, are deprived of any water from the two projects. The representatives who spoke before the ministers were Kalpesh Tadvi, Narendra Tadvi, Vijendra Tadvi, Naresh Tadvi, Chandrakant Tadvi, Bhailal Tadvi, Dakshaben Tadvi, Gemjibhai Tadvi and Ambaben Tadvi, all belonging to the Sitter Gaam Adivasi Sangathan, especially formed to protest against the government’s move to convert the region into a tourism spot. Representatives of the environmental NGO, Paryavaran Suraksha Samiti, Lakhanbhai Musafir and Dipen Desai, were also present on the occasion.